This record was a hit in the Netherlands in 1970, but didn’t bother the charts in the UK. It did receive considerable airplay on the pirate stations Radio Northsea International and Radio Veronica at the time of its release. 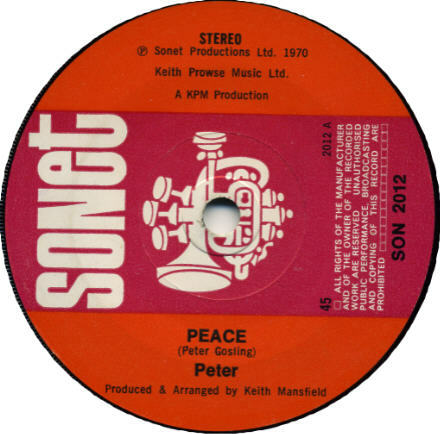 I am afraid my copy of Peace by Peter has the most enormous scratch across the whole record which even Audacity cannot remove. I’m still going to put the mp3 here because I’ve got used to hearing the version with the scratch and its a reminder of the days before music was digital and “perfect”. However if anyone has a clean mp3 copy to send me that would be nice as it really is a fab pop record. PS: And guess what….the other day some kind soul DID send me a better version of this timeless tune which is right here. Thanks..you know who you are. And a message to the world in general: ” Why can’t we have Peace…….all the time”.